America has been built and shaped by its ability to move people and goods freely and quickly, fueled by oil. But this “freedom” comes at a cost. Transportation is America’s number-two consumer cost after housing. American drivers pay $8,000 a year for an auto they drive only 4 percent of the time. According to RMI research, using vehicles more productively can provide the same or better access to transportation services with 46–84 percent less driving. Fortunately, we can now access and share detailed transportation data on an unprecedented scale, allowing creative software app developers to expand and enhance our mobility options. It all amounts to an emerging new transportation paradigm. While eating breakfast, you receive a notification on your smartphone alerting you to weather-induced traffic delays along your normal route to work. You decide to take the suggested alternative route that will save you 15 minutes. You then reserve parking in a nearby garage at a fraction of the cost because you received a half-price push notification coupon. While walking to your car, you notice a street lamp with a burnt-out light bulb. You snap a photo with your smartphone and place a work order with the city, and in doing so, qualify yourself for a monthly cash prize drawing. On your drive, your car alerts you to two potential rideshares along your current route who have five-star ratings, so you agree to pick them up and make a few bucks. When you drop the passengers off, their mobile phones automatically complete the payment transaction. In the parking garage, you redeem your coupon and pay the discounted daily rate, all on your smartphone, which then automatically logs the location of your parking spot so that it can help you find it later. Many emerging factors are making this vision a reality, and many areas of the country have made strides toward it. Scaling these solutions to their full potential will require a transportation system that is instrumented, interconnected, and intelligent. 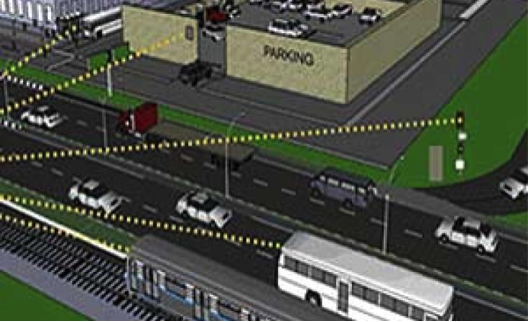 Instruments include smartphones, sensors, and onboard vehicle hardware that enable continuous collection, communication, and processing of mobility data—anything from traffic and weather conditions to parking spots and rideshares. This data can then be made widely available on an interconnected data grid. Sounds like the Internet, right? Except to be fully functional and responsive, the transportation data grid will have to be capable of handling “big data”—information that is unprecedented in its volume, velocity, and variability. All that data racing across that grid is useless until it is processed and used to optimize user mobility. That’s where the intelligence comes in. In particular, user-facing software applications can transform what would otherwise be an overwhelming and nonsensical sea of numbers into an intelligible and accessible graphical interface. What can software developers and municipalities do to deliver the elements of this intelligent transportation system to end-users, and what are they doing already? One of the biggest enablers of intelligent transportation is an open-data approach. Most cities manage their traffic and transit data on private databases, accessed exclusively by municipal staff to monitor system performance and implement improvements. Imagine: instead of a few municipal staff thinking about how to improve their isolated systems, millions of software developers look to gain lucrative market share in the information space—from established powerhouses such as Google and IBM to individual programmers on smartphone app stores—all contributing their own innovations. Not only would cities tap into a much larger pool of creativity, the collective innovation would be infectious, and individual successes could be quickly replicated and spread to multiple cities. Many already have: 4 percent of the 400,000 monthly trips on Bay Area Rapid Transit (BART) are planned using Embark, a multi-modal trip planning iPhone app started by three college students, that has since spread nationwide. ParkMe, another smartphone app that specializes in predictive algorithms to direct drivers to the best available parking locations, has built an entire business case around providing parking data. While this app is free to customers, developers are willing and eager to pay for ParkMe’s data because they can transform it into their own revenue stream from drivers in search of parking. Many cities are prepared to spend millions on infrastructure upgrades such as widened roads and more parking lots. Others are constrained by budget limitations and don’t have millions to spend. In both cases, cities would do well to invest relatively little to standardize and disseminate their transportation data. This could harness the legion of problem-solving, self-motivated software developers who can help them make the most of their existing roads and parking lots. It also helps planners make informed decisions about whether, where, and how to build new infrastructure, all while expanding transportation options and enhancing mobility for the rest of us.